TL variable 5.2-6.5 mm, largest HL 1.6 and HW 1.33 mm. Colour dark, black-brown or brown-red; petiole scale, tarsi and part of gaster red. Head elegantly and regularly reticulate, thorax near smooth with a few puncturations. Head widest posteriorly. Eyes black and small, 30-40 facets, distance from mandible bases some 1.5 times their length. Clypeus convex, but without well defined median "gibbosité", apex short and relatively large. Mandibles brown, a little punctured, with 12 black fairly large and subequal teeth. 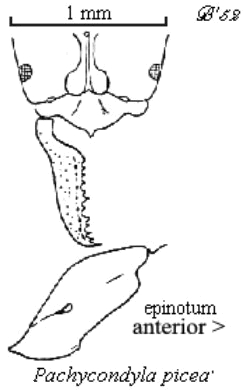 Propodeum (epinotum) rectilinear in profile from both aspects, less convex than related species Mesoponera villiersi and the southern African Mesoponera elisae, limited laterally by notable rolled margins. The photomontage of the type worker is collated from http://www.antweb.org/specimen.do?name=casent0913744 .